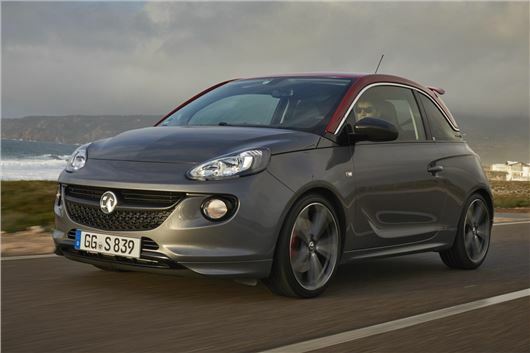 Vauxhall has revealed that the range-topping Grand Slam version of the Adam costs £16,995 without options. It’s available to order now, with first deliveries expected in March. Featuring a 1.4-litre petrol engine with 150PS and 220Nm, this is the Adam best equipped to turn the heads of potential MINI Cooper and mid-range Audi A1 buyers; the Grand Slam’s 0-62mph sprint is done in 8.5 seconds and it’ll hit 124mph, while returning a 47.8mpg average and 132g/km CO2. The newest Adam stands out by way of a ‘Red ‘n’ Roll’ roof colour that’s exclusive to the Grand Slam model, and extends to the roof pillars (as pictured above). It sits on relatively massive 18-inch alloy wheels housing red brake calipers – part of a braking setup developed by Vauxhall’s VXR tuning specialists. A VXR Styling pack adds a rear mounted roof spoiler, side skirts and a low rear skirt incorporating a chrome exhaust pipe. Inside, aluminium sports pedals await the driver’s size tens, electronic climate control is standard, as is a DAB radio and Bluetooth audio streaming, there’s a seven-inch touch screen, and the leather steering wheel includes audio controls. And in a nod to a particularly quirky BMW-owned British rival who shall remain entirely anonymous, a colour-changing LED interior lighting pack is optional.